Even before the catastrophic events of July 24, 1916, as many as 70 men died constructing Clevelands waterworks system, due to a series of accidents. After 2 years of work, the tunnel between Crib #4 & 5 was a few months away from completion. 5 miles out from Lake Eries shore, the danger was apparent for the 85 men who lived and worked at Crib #5. Numerous small explosions and overwhelming gas leaks caused men to refuse to work and quit the job. 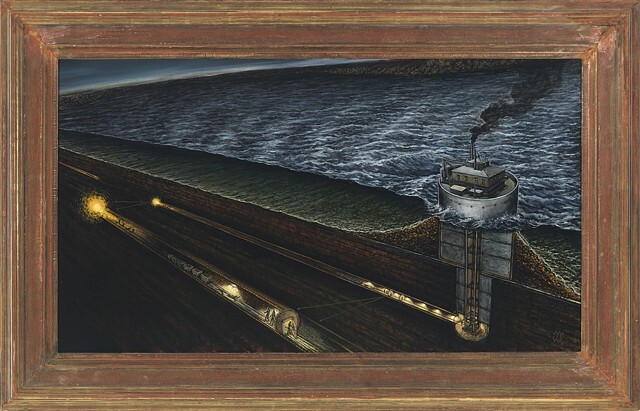 As the men reluctantly resumed work, at 9:22 p.m. on July 24, the pressure gauges at the surface indicated catastrophe when the tunneling crews machinery ignited a gas leak 1500 feet down the tunnel. Immediately after the explosion, rescue attempts were made, which resulted in the rescuers being overcome by the gas fumes. Crude emergency signals were sent by whistle and rocket flares. Gus Van Duzen, superintendent, arrived after midnight and after several rescue attempts only a few men were brought back to the surface. At dawn, Garret Morgan arrived with his invention  the first gas mask. Along with his brother, Frank, and two volunteers, Garret descended into the tunnel and after four trips, the rest were rescued and removed. The explosion caused 20 deaths, and 10 or more injured, although the numbers were vague. Garret Morgan was a brilliant African American whose heroism and ingenuity was overlooked and mostly ignored at the time, despite his efforts that night.